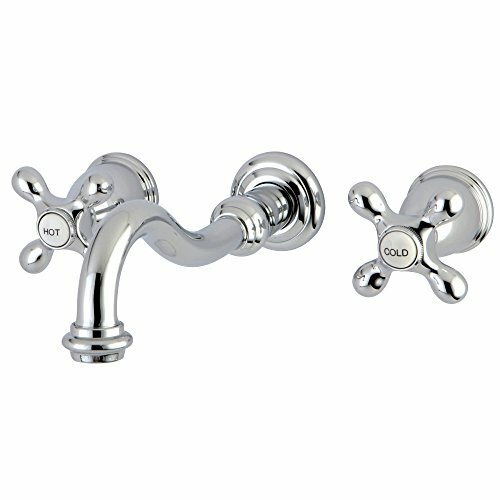 This modern double-handle bathroom wall-mounted sink faucet will add versatility to any bathroom decor. Constructed from solid brass for durability and reliability, finished in a high quality, corrosion resistant polished chrome. 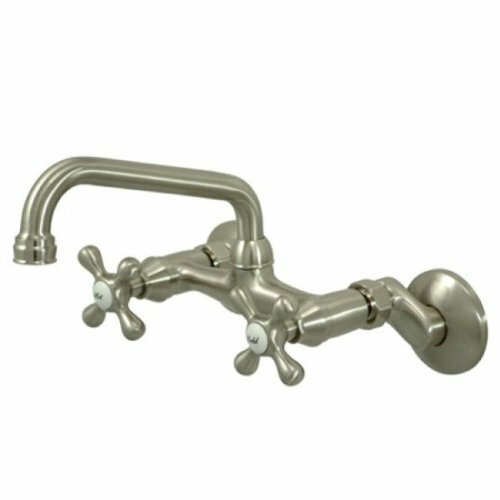 Feature: Wall Mount Finish: Chrome Body Material: Brass Spout Material: Brass Number of Handles: 2 Number of Installation Holes: 3 Spout Reach: 6.69" (170mm) Valve Type: Ceramic Valve Drain Assembly Included: No All mounting hardware is included. Classic style. Metal cross handles. Wall mounted. 8.5 in. Victorian swivel spout. 1/4 turn ceramic disk cartridge. Finish resist to scratches, corrosion and tarnishing. 11.75 in. spout reach from the wall. On/off water control mechanism. 6 in. to 8.5 in. adjustable spread. Spout rotates 360 degrees. Max 1.8 GPM/6.8 LPM At 60 PSI. An integrated removable aerator. Warranty: 10 years. Made from brass. Made in Taiwan. 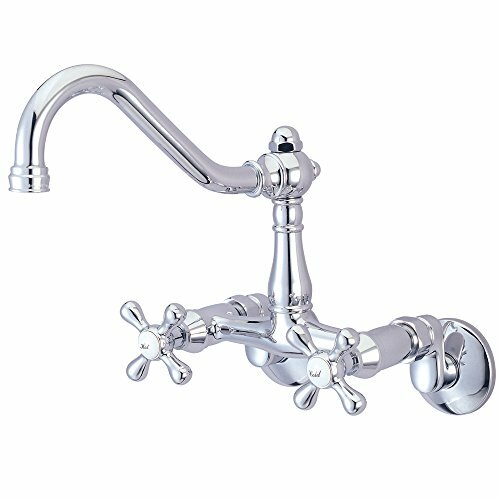 This kitchen faucet consists of elegant, with an early American style that befits a subtle, glamorous design. 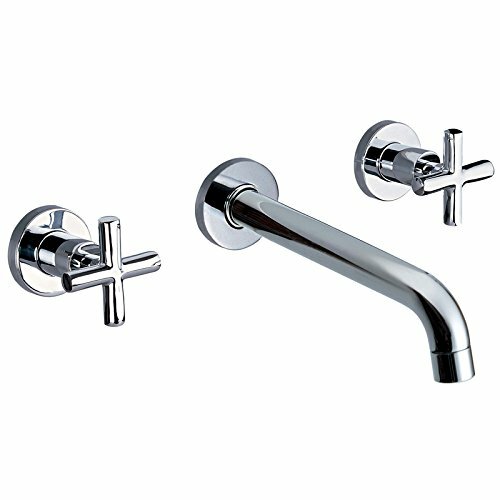 Specification: - Installation Type: Wall Mounted - Finish: Chrome - Style: Contemporary/Modern - Body Material: Brass - Spout Material: Brass - Number of Holes: 3 - Number of Handles: 2 - Overall Height: Not fixed - Spout Height: Not fixed - Spout Reach: 8.07" / 205mm (measured from faucet base center to spout outlet center) - Faucet Centers: 8" (200mm) - Flow Rate: 1.5 GPM / 5.7 LPM - Valve Included: Yes - Valve Type: Ceramic Valve - Drain Assembly Included: No Package Included: 1 * double handles bathroom sink faucet rough-in valve and mounting hardware No worry to buy: - This item is refundable or exchangeable if there's damaged parts. - No reason return is available within 30 days after you received the package. 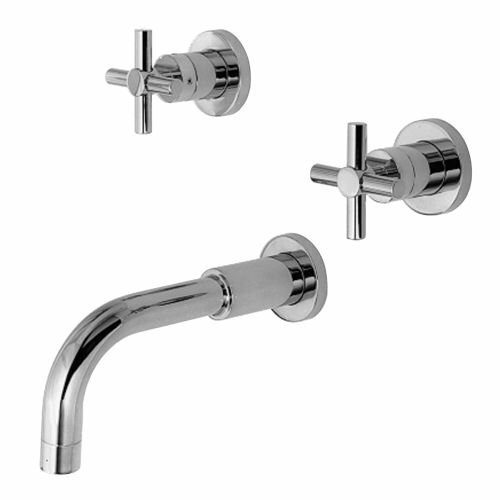 Product Type: Bathroom Faucets Easy to install wall-mount fixture. Constructed from solid brass for durability and reliability. 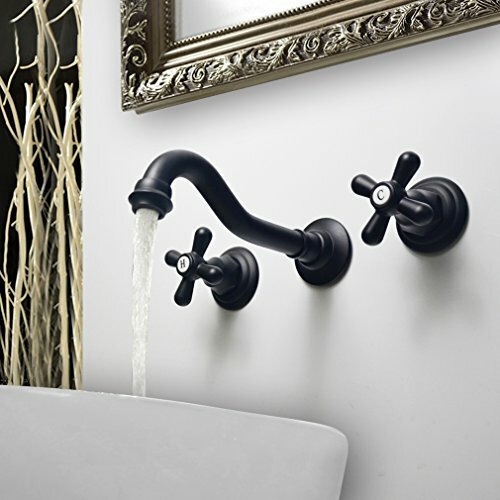 Feature a slender spout with gentle curves for an elegant flair. 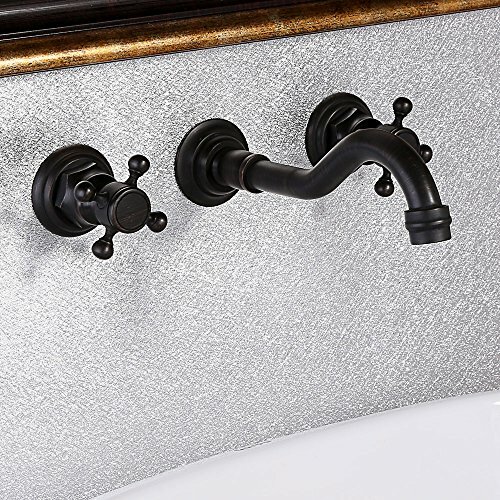 Product Information: Style: Traditional/Classic Finish: Antique Black Material: Solid brass Number of Holes Required: 3 Number of Handles: 2 Installation Type: Wall Mounted Valve: Ceramic Valve (included) Drain Included: No Dimensions: Faucet Centers: 8" / 200mm Overall Height: 2.28" / 58mm Spout Height: 2.28" / 58mm Spout Reach: 7.44" / 189mm Package: 1. 1 x Bathroom sink faucet 2. Necessary installation fittings Notice: Not suitable for low pressure. Minimum required water pressure is 0.05 MPa (0.5 bar). Check if all the fittings are complete before installation. If you need any help, please feel free to contact us immediately. 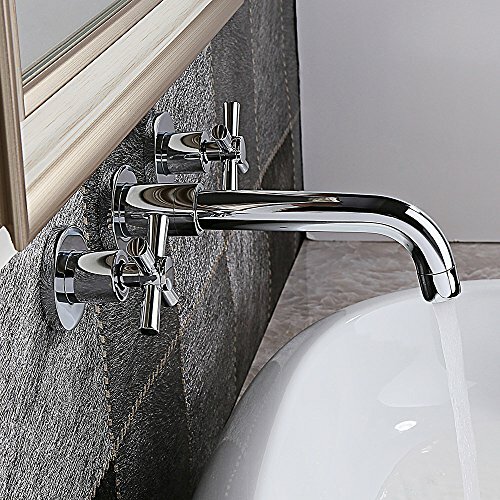 Touched with stately escutcheons, pair your vessel sink with the addition of this wall mount widespread faucet from the vintage Collection, furnished with a shining polished Chrome finish. 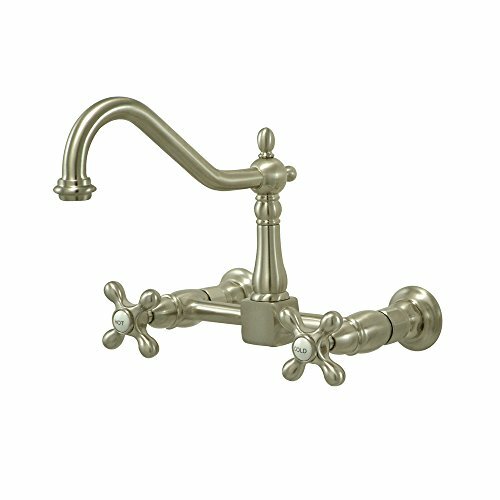 Given its quality brass construction, the faucet is sure to last years for its excellence in durability and endurance. 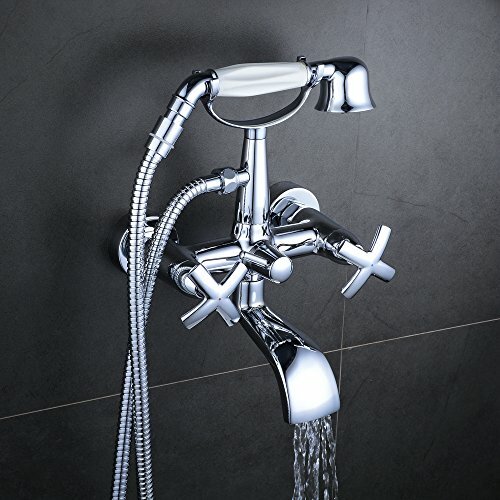 Equipped with a ceramic disc cartridge, the faucet provides a maximum water flow rate of 1.2 GPM. Save yourself counter space with the traditional design of the faucet paired with elegant 'hot' and 'cold' labeled cross handles to finalize your vessel sink pairing. Generic style. Metal cross handle. 7 in. swivel tubular spout. 0.25-turn on and off water control mechanism for water volume and temperature. Faucet operates with ceramic disc valve for drip-free functionality with Max 1.8 GPM/6.8 LPM Water Flow Rate At 60 PSI (ASME standard). Integrated removable aerator is fitted beneath the spout's head piece for conserving water flow. 11 in. spout reach from wall. 30.63 in. - 80.5 in. adjustable spread. Warranty: 10 years limited. Made from solid brass for durability and long-lasting usage. Satin nickel finish for corrosion and tarnishing resistance with handles. Made in Taiwan. This double handle wall mount kitchen faucet is timeless and offers a look that attracts those who appreciate traditional and contemporary designs. Elements of Design ES1248AX Heritage Wall Mount Kitchen Faucet, 8" Spread, 12" Spout Reach from the Wall, Satin NickelElements of Design ES1248AX Heritage Wall Mount Kitchen Faucet, 8" Spread, 12" Spout Reach from the Wall Features:; Brass Construction; 1/4 Turn Ceramic Disk Cartridge; Metal Cross Handle; Satin Nickel Finish; 8" Spread; 12" Spout Reach from the Wall; Max 1.8 GPM/6.8 LPM At 60 PSI. Copyright © Wholesalion.com 2019 - The Best Prices On Double Cross Handles Wall Online.